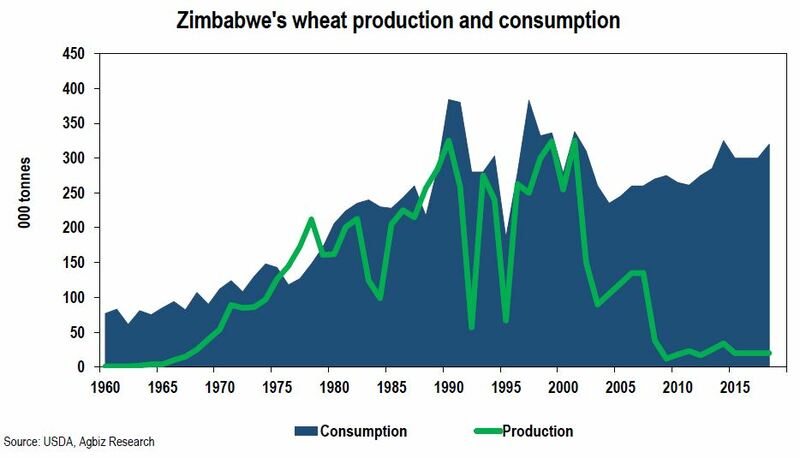 Zimbabwe is increasingly consuming more wheaten products. Over the past five years, the country’s wheat consumption has increased, on average, by 3 percent a year to an estimated 320 000 tonnes in 2018. This has largely been driven by a growing bread demand. Estimates from the United States Department of Agriculture shows that Zimbabwean bakeries produce roughly 850 000 loaves a day. With local production having slumped since 2000, the country relies on imports to meet domestic requirements. This has amounted to an average 305 000 tonnes a year over the past five years of which South Africa supplied 34 percent. Trailing behind was Russia with an average share of 17 percent over the past five years. The other notable wheat suppliers to Zimbabwe are Poland, Mozambique, Australia, Lithuania and Ukraine, amongst others. This year could present more of the same, as Zimbabwe’s wheat production prospects are quite dim again, with the harvest estimated at 20 000 tonnes, which is unchanged from last year. This is a result of limited expansion in area planted, combined with expectations of lower yields. The lower domestic wheat production volumes will subsequently lead to a 7 percent annual increase in Zimbabwe’s 2018 wheat imports to 320 000 tonnes. The key suppliers are likely to be similar to the aforementioned countries. This is contrary to the view shared by the government last year that there were efforts underway to revive this industry after a decade-long declining trend. According to the United States Department of Agriculture, some of the key production constraints in Zimbabwe are the high cost of production coupled with relatively low capital returns. Hence, some farmers have a made a switch to other more profitable crops. To be fair, this is also true for South Africa, which has seen a steady decline in wheat area plantings over the recent past (this is a topic for another day – we are talking about Zimbabwe tonight). The dismal performance in production is limited to Zimbabwe for now. Other regional wheat-producing countries such as South Africa and Zambia could recover from 2017 levels.